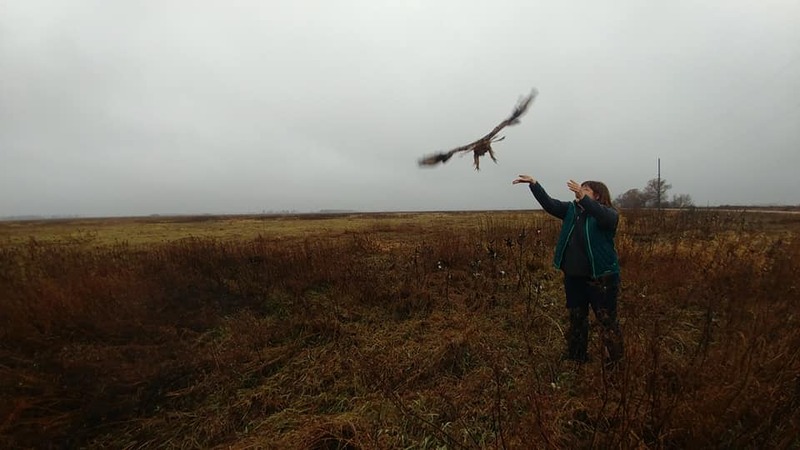 Rough-legged Hawk Released! — Raptor Education Group, Inc.
On June 8, 2018 a Rough-legged Hawk was admitted to Raptor Education Group, Inc. (REGI) She was near death when admitted. She was severely emaciated and suffered from hypothermia. We did not think this beautiful bird would live for the next few hours, let alone recover fully and be released again to the wild. But we are delighted to tell you, that yesterday she did just that. Rough-legged Hawks are winter visitors to our region; however, they breed in the open country of the Arctic tundra and taiga. In June, when this beautiful hawk was admitted to REGI, she should have already been back in the Arctic preparing to breed rather than languishing in the WI countryside near Willard, WI. It seems for whatever reason this beautiful hawk was unable to make her spring migration home. Perhaps it was a rodent poison that made her too sick to hunt or an injury that compromised her ability to fly. We were only guessing at the reason for her condition, but the result we could plainly see and that was starvation. The patient was in such critical condition, she was tube fed only 20 ccs. at a time and that was every 2 hours even thought the night. The process of re-feeding emaciated birds is complicated and labor intensive. Finally, after a few weeks, she was strong enough to begin to eat some meat on her own, tube feedings were reduced to 3 times a day. She was with us in rehabilitation for six months! We celebrated her milestones gaining weight and strength and finally conditioned her muscles again for release. Yesterday was that special day that she got to go back to the wild. We wish her well as she has her second chance at life. Many thanks to our staff, transporter and summer interns that were vital in this beautiful birds difficult recovery. 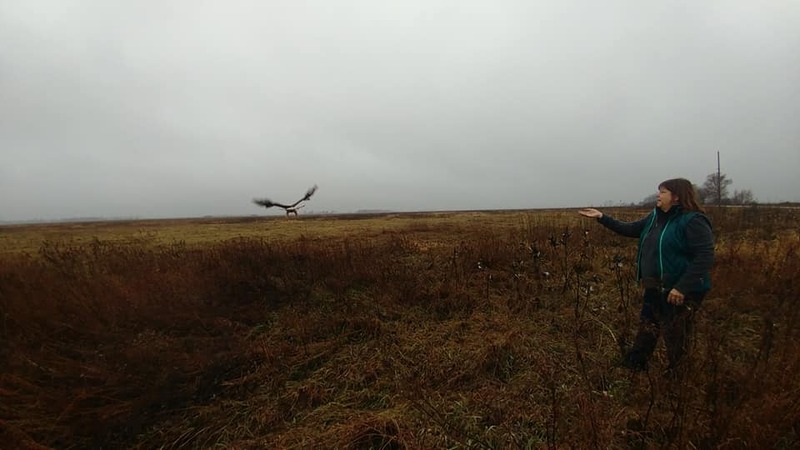 Rough-legged Hawk at the release site. Release area is important to a rehabilitated birds success. It is selected to give the bird the best opportunity for a stress free reintroduction to their world. The hawk surveyed her surroundings with great delight. 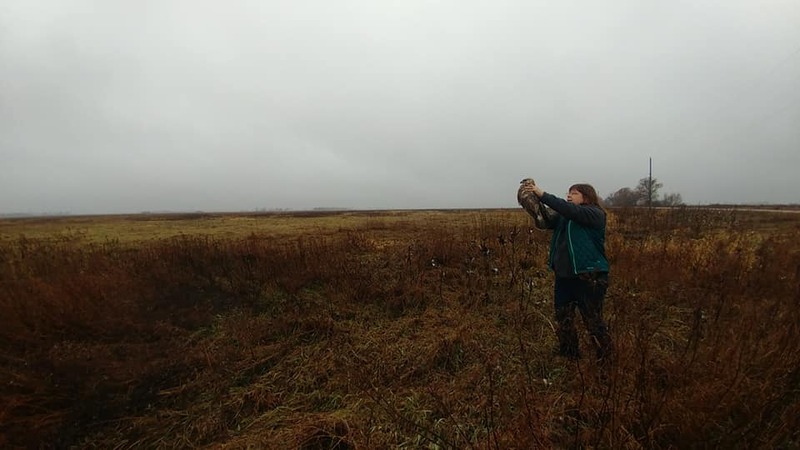 Preparing to release the Rough-legged Hawk back to the wild in a protected wildlife area with prefect habitat for her species. Jean Pichler allows the hawk to accommodate to get surroundings before release. As Jean simply opens her hands, the hawk takes to flight. And she is airborne to be captive no more. Free as a bird and on her way to seek her destiny.